Let the sound of bells ring in the spring season! Newly released is this 500 piece puzzle by Springbok. 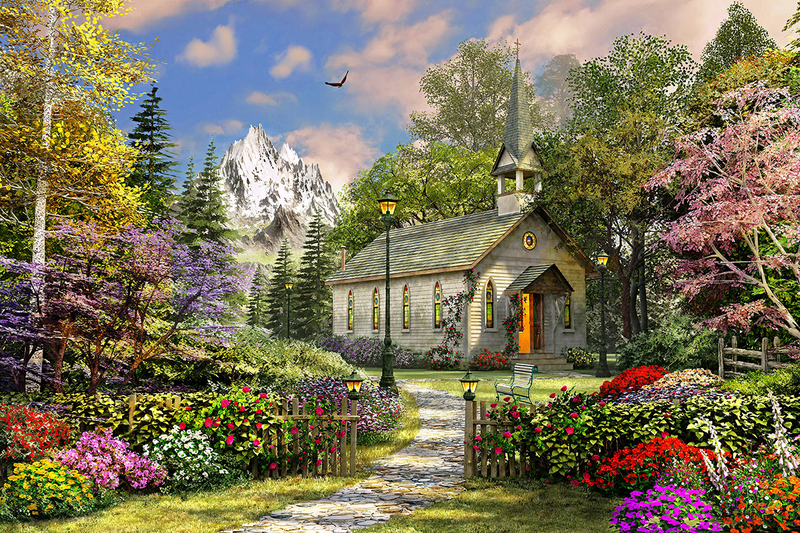 Flowers burst into color alongside a humble cobblestone path, welcoming visitors to this secluded and tranquil church. The soft pinks and yellows of nearby trees complete this picturesque scene, as the snow glistens on the lofty mountain peaks. Reviewer: Steve from Westcliffe, CO. This puzzle was fun and moderately challenging. My only minor criticism is that the puzzle didn't include the outer perimeter of the image shown on the box. Otherwise, the quality was good. Other puzzles I thought were a little more attractive, so I have framed and mounted them.